For decades, a stereo with a turntable was nearly as common a sight in American households as the television. Eight-tracks, cassette tapes and even compact discs have had relatively short lifespans in relation to the vinyl record album. Today, many music lovers enjoy collecting from the long tapestry of recordings, preferring both their sound and their presentation. Although the demand for vinyl remains high, there are a few things to consider while sorting through vast amounts of worthless vinyl recordings trying to find that rare gem. Evaluate the condition of the record. Record collectors generally rank vinyl condition from "mint" to "good," with albums in lesser condition being worth very little. It is important to be realistic when grading the condition of an album. Several deep scratches that cannot be smoothed out and inhibit smooth needle movement signal an album that has been listened to many times and probably not stored very well. "Mint" condition records are very rare and therefore more valuable. This also applies to record sleeves and covers. Album inserts and cover art help to make albums valuable in the collecting market. Evaluate the demand for the album. Rare albums, either poorly distributed, quickly out of print, or from obscure labels, garner the highest value. Albums from well-known artists, such as Elvis Presley or The Beatles, retain their value better than others, but this can have limiting potential as well. The most popular artists of the vinyl age (for LPs, 1948 to1984) received much larger distribution for their albums and, because of this, their albums are much less rare. 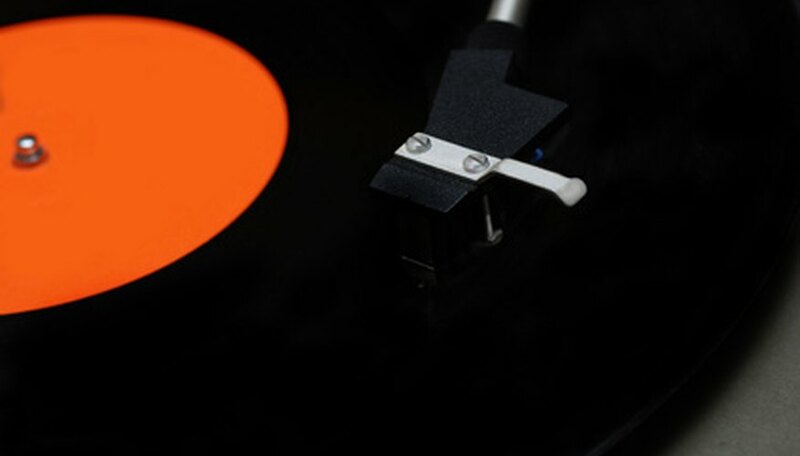 Valuable records may have some of the following features: an original recording (re-issues are distributed for demand and therefore less valuable); an album that went quickly out of print or was released by an obscure record company; contained a banned or missprinted cover; and/or was released by an artist that has retained popularity through the years. Inquire for estimates. Record buying guides are available in most bookstores and libraries, and are an appropriate place to start estimating the value of records. Most cities have accessible used record stores, and they are the easiest, but not the most accurate, place to get an estimate for an album's value. The disadvantage of local record stores is that they have local demands and shelf storage issues. A record may have some value, but it is already in stock at the local store, decreasing its value. Online record guides and record collectors can help derive a more accurate market demand, but the condition of the album is unseen by the evaluator. Utilizing all of these methods of estimation is recommended, as it will provide a good range of estimates. Test the market. Online auctions are a good place to estimate and test it out on the actual record buying market. Raise the estimated value somewhat to be safe, and wait and see what people offer. Consignment sales, flea markets, and even yard sales are also a good place to sell vinyl records as long as the value of the records is protected. It is very difficult to accurately gauge the possible value of any collectible. Just as the condition of an album may be somewhat subjective, demand for albums relates to a nearly unlimited set of factors. The record industry packaged music for home enjoyment for nearly a century in either 45 rpm, EP (extended play) or LP (long playing) format, and the nearly indestructible nature of vinyl records has meant that most of this vast collection of music and recorded history is still out there somewhere. "Vinyl Records Collectors Guide: Price Guide for Viny Records"
"Just Press Play: Are my Old Vinyl Records Valuable"
"Record Colloctors Guide: Estimating the Value of Your Records"
Eric Erickson has written professionally since 2004. He is a published poet with work appearing in "Plainsongs" and "The Curbside Review." He was a staff writer for the websites IndependentMovieReview.com and IndieMusicStop.com. Erickson received his Bachelor of Arts in English from Metropolitan State College of Denver.